They're baaaaaaaaaaaaacckkkkk!!! Rocky Coast Radio Theatre returns with yet another copious cornucopia of classic concoctions, crafted and compiled for the captive congregation (gotta love that thesaurus!). They're baaaaaaaaaaaaacckkkkk!!! Rocky Coast Radio Theatre returns with yet another copious cornucopia of classic concoctions, crafted and compiled for the captive congregation (gotta love that thesaurus!). 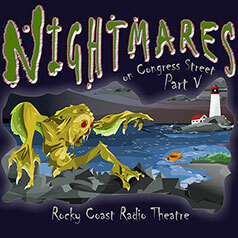 Nightmares on Congress Street, Part V offers dramatized adaptations (complete with music and sound effects) of chilling stories penned by Edgar Allan Poe, Hugh B. Cave, and H. P. Lovecraft, as well as a few additional treats. So douse the lights, snuggle up with your favorite corpse—oops! "life-challenged" person—and prepare to be thoroughly goosebumped.